Longtime readers will remember Mathias and Zachary, the unfortunate children suffering from Neurodegeneration with Brain Iron Accumulation, a genetic disorder that leads to horrifically painful spasms beginning in early childhood, and death as a teenager. I wrote about their case in Ketogenic Diet for NBIA (Neurodegeneration with Brain Iron Accumulation), February 22, 2011. Both boys have begun smiling and laughing all the time. Nothing inspires happiness more surely than the cessation of extreme pain! My speculation is that a ketogenic (or high-fat) diet helps in NBIA by allowing Coenzyme A, the crucial enzyme which is under-generated in NBIA, to be redistributed from organs like the liver and muscle, where it is manufactured in abundance, to the brain where it is most needed. On a ketogenic or high-fat diet, more CoA is created and it is more often bound in water-soluble forms (such as acetyl-CoA, acetoacetyl-CoA, and HMG-CoA) that can cross cell membranes and enter the brain. Zach is actually doing really well. He is following your diet still (not into the ketogenic range but otherwise following it more or less precisely) … He is off nearly all of his medicines and is able to do things that he never could in his life. 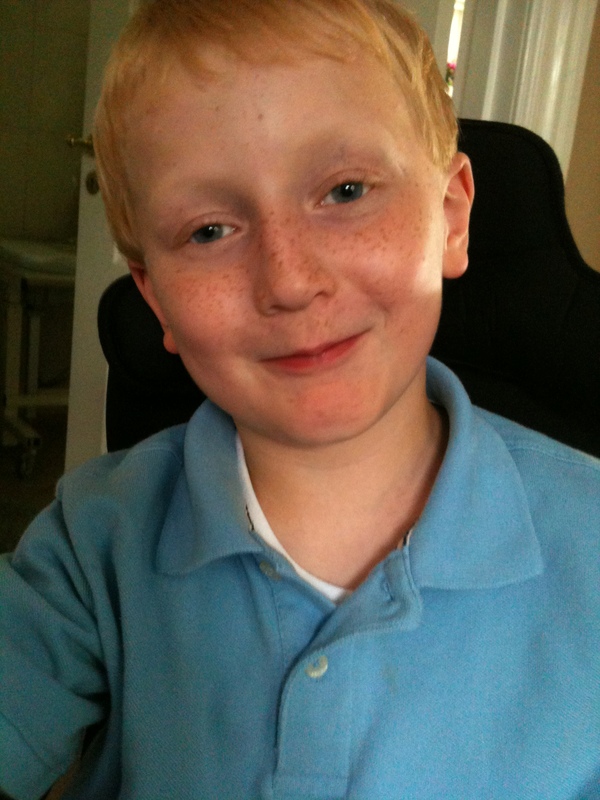 He is not well – but he is not in pain and has no spasms, and is doing school work etc. An aside: I’ve been hearing recently from a number of people who experienced great benefits in neurological conditions – NBIA, epilepsy, migraines, and others – following the ketogenic version of our diet, and later transitioned to the regular version of PHD with more carbs and less fat, and continued to maintain all the neurological benefits they had first achieved on the ketogenic diet. Perhaps it was not the ketosis that was crucial, but some other aspect of PHD, such as reduction of inflammation or improved nutrition. I want to let you know that on June 23, Mathias died of septic shock. He went into the hospital 10 days prior with pneumonia and we were packing to go home on the following Friday when he got a sudden fever. The doctors asked us to stay one more day – his lung x-rays were clear but they were concerned about the fever. On Saturday, his fever went to 41 degrees Centigrade. On Sunday, it went to 42 degrees. Despite every available antibiotic and all other attempts to save him, Mathias died peacefully with a strong heart (153 beats per minute – and breathing on his own). He was surrounded (even in Intensive Care) by his whole family, plus his aunt, and two of his long time helpers – plus two of his nurses and two doctors. We thought it would be a few more days and we were all hugging him, and laughing with him and telling him stories. From one second to the next, his heart stopped. We choose to believe that Mathias decided – down to the last second – what and how he was going to leave his earthly body. He had no cramps, no spasms, no pain. He just let go surrounded by love. We are privileged and honored to have known such a brave, smiling, incredible person. He did more and affected more people in his 9 years of life than most people do in their entire lives. He was always happy, always smiling – a gift to everyone around him. Thank you for being part of the forces around his life who helped support him, love him, and provide him with the best life that was possible for him. Thank you from the bottom of our hearts! Farewell Mathias. May you rejoice in God’s kingdom, where all love and all are lovable, and all tears are wiped away. Requiescat in pace. The weekend was happy for us, because a number of readers left word of health improvements. I too have had Raynaud’s all my life … In the past two months, I have modified my diet in line with Paul’s suggestions for Migraine. I now eat 200 calories worth of safe starch, all the recommended supplements, and as much coconut oil as I can stomach. I am also doing the 16/8 fast. My Raynaud’s has further improved, as measured by the fact I sometimes forget to turn the heat up in the morning, and cold extremities don’t always alert me to my forgetfulness! I definitely feel 100% better with a more appropriate caloric intake and some starch. You have blessed my life. I had one final symptom that was chronic all my life. Constipation. I e-mailed you last week and you offered up some suggestions. PRAISE THE LORD! I have had NO IBS, or constipation since following your advice. I am, and will be forever grateful. I’ll discuss my constipation advice in Thursday’s post. Today I want to discuss migraines. Thanks for asking about the Migraines. They are in fact vastly improved, which I attribute solely to your recommendations. I can say that, because I have tried virtually everything else in the past. Kate sent me a full account of her experiences by email. It is fascinating and she has given me permission to share it. The next section was written entirely by Kate. Thanks for asking about the migraines. They are in fact vastly improved! Since they have been so intractable in the past, I guess I was waiting to make sure the effect was stable before I reported my results. But clearly something remarkable is happening, thanks to your recommendations! A little history. I started getting these headaches in my late 30s. (I am now 52). In the beginning I thought I had the stomach flu, because in addition to the headache I would always throw up or have dry heaves. The worst headaches would keep me immobilized in bed for up to two days. My brother-in-law, a neurologist, convinced me they were migraines. I finally consulted a doctor, who put me on midrin, which did not help, and a few months later I started on imitrex, which did help, at least at first. Eventually, my headache pattern evolved, and I had at least a mild headache every day, punctuated by the occasional doozy. Apparently, this is a pretty common progression, especially with women my age. I always suspected there was something wrong with my lifestyle or diet, and over the years I have tried numerous experiments, but nothing ever worked. Here is a summary of what I have tried, more or less in order. Unless noted, these were all for three months. Amitriptyline, a tricyclic anti depressant—my first foray into pharmaceutical prophylactics My doctor insisted I consult a neurologist Tried for 4 months. Slept like a zombie, and acted like one. No help with headaches. 45 minutes of low intensity aerobics 6 days a week Inspired by Crowley and Lodge’s Younger Next Year—Never mind I had been exercising regularly all my life. Got a heart rate monitor and got after it. No help for headaches. No caffeine, alcohol, triptans, or over the counter analgesics Buchholz Heal Your Headache. I love my coffee, so this was a big step for me. Did this for four months. Very sleepy for first few days. Did NOT help with headaches. However, I felt I could rule out medicine overuse headaches. Cerapamil—A calcium channel blocker My primary care manager thought it would be worth a try. Tried for four months, and upped dose after a few weeks. Extreme constipation and painful cramps. No help with headaches. Low carb diet Found a reference to a german website of someone who had cured his headaches with a low carb diet. I had always though low carb diets were ridiculous, but decided to give it a try Immediate improvement within a few days! Also cured insomnia and acid stomach within a week. Headaches were less severe by about 50%. Frequency was unchanged however. Remained on low carb diet and manipulated the variables, but did not find further headache improvement. Nortriptyline–another tricyclic antidepressant My brother-in-law, a neurologist thought I should try it. Did seem to help a little. Had to stop in less than a month because it gave me high blood pressure. Birth Control-Yaz PCM sent me to gynecologist for heavy menstrual bleeding. Benign fibroids found. Doc was sure Yaz (without placebo pills) would help heavy bleeding and headaches. I didn’t care about the bleeding, but I rose to the headache relief bait. Tried for five months. Spotted every day, but got no headache relief. Inderal-a beta blocker Neurologist Seemed to help, but my blood pressure went too low. Self analysis, meditation Sarno The Mind Body Prescription I think there is something to this, but no headache relief for me. Do feel more at peace with myself. Topamax-epilepsy drug Neurologist Low dose did not help. Worked up to 100mg over four months. Did not help headaches. Gave me extreme anxiety about driving on limited access roads. I didn’t notice the connection, but my college age daughter did. I immediately tapered off. Got off the Topamax last summer, and forswore further pharmaceutical prophylactics at that point. In the meantime I stumbled upon the profusion of “primal” material that is now out. I had not read any low carb stuff for a couple years, and I enjoyed reading Sisson, Wolf, Cordain, et al. I started eating more saturated fat. I also read Fallon’s Nourishing Traditions, and started eating liver again, which I had loved as a child. Her book inspired me to order some kelp tablets for iodine, and I took one here and there when I thought of it. In January, in my blog travels, I stumbled on your site. I ordered the book and was intrigued by your and Shou-Ching’s ideas about disease and chronic conditions. I was already familiar with the idea of a ketogenic diet for epilepsy, so I was immediately interested in trying a more ketogenic diet for myself. I ordered all your basic supplements, and immediately upped my kelp to two capsules. I had been using coconut oil for curries, so I started using it habitually. Started eating 200 calories of starches that you recommended—this was a little scary, after studiously avoiding them for four years! I was afraid I they might keep me awake at night, but I am sleeping like a log. Started fasting 16/8, which was easy once you absolved me for having cream in my morning coffee! Within a week of starting this regimen my chronic headache started to disappear! Some days I would only have a headache for part of the day, and occasionally I would have no headache at all! I read somewhere on your site that NAC is good on a ketogenic diet, so I ordered it too. I had never heard of this supplement before. It seems to have made a further positive difference. I have started taking it twice a day. Once before bed, and once in the late afternoon, when the headache sometimes starts coming back. Since I added NAC, I have been nearly headache free. Another amazing development concerns anxiety. Over the years I have become somewhat anxious when I drive on highways. I grip the steering wheel tightly, sit forward in the seat, and am generally hyper vigilant. I always chided myself for my lack of nerves, but that didn’t help. As mentioned above, this was magnified by the Topomax. I never had this issue when I was younger; indeed I used to fly helicopters in the army. Two weeks ago I drove up to New Jersey to pick up my daughter, a 3.5 hour trip from where I live in Northern Virginia. I stopped two hours into the trip to make a pit stop, and I suddenly realized I was totally relaxed, and had been for the entire trip! The PHD is strong brain medicine indeed! Thanks for all your research, insights, and ideas. I think the Perfect Health Diet is going to be a game changer for many people. Hopefully it is the start of a sea change at how we approach the chronic maladies of our times. Thank you, Kate! That’s a fantastic chronicle of your history. This is already a long blog post, so I won’t go into an analysis of why and how the ketogenic variant of the Perfect Health Diet can cure migraines, reduce anxiety, and improve sleep. I’ll only add a few things. I realize that you’ve already tried those, Kate, and didn’t notice an effect, but you may notice a benefit now that your diet is better. If in the past they reduced headache severity from 100% to 99%, you wouldn’t have noticed a change. If now they reduce severity from 2% to 1%, or 1% to 0%, the improvement might be obvious. So you might re-consider them now. I believe that fading benefits are likely a result of eating the wrong diet, and that on the ketogenic version of the Perfect Health Diet the good effects will prove permanent. But time will tell. 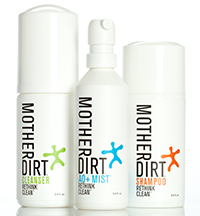 We believe that diseases are generally caused by food toxins, malnutrition, and pathogens. The Four Steps of the Perfect Health Diet eliminate food toxins, optimize nutrition, and enhance immunity; therefore they remove most of the causes of disease and should render most diseases curable. But we had no idea, last October when our book was released, which cures would appear first. It’s interesting that migraines are appearing so early as a curable disease. I think this says a lot about the discipline, and eagerness for a cure, of Rob and Kate. Rob was willing to fast for 30 days (! ); Kate read the book in January and was able immediately to make substantial diet, lifestyle, and supplement changes. It seems that a painful but non-debilitating disease will create the most dedicated, venturesome patients. I’m very grateful to Kate for trying the diet and sharing her story. Hopefully we can bring the good news to others, and gather more evidence to prove that diet is the best therapy – for migraines, and for many other diseases as well. Strahlman RS. Can ketosis help migraine sufferers? A case report. Headache. 2006 Jan;46(1):182. http://pmid.us/16412174. Kabbouche MA et al. Carnitine palmityltransferase II (CPT2) deficiency and migraine headache: two case reports. Headache. 2003 May;43(5):490-5. http://pmid.us/12752755. Triggs WJ et al. Neuropsychiatric manifestations of defect in mitochondrial beta oxidation response to riboflavin. J Neurol Neurosurg Psychiatry. 1992 Mar;55(3):209-11. http://pmid.us/1564483. Sun-Edelstein C, Mauskop A. Foods and supplements in the management of migraine headaches. Clin J Pain. 2009 Jun;25(5):446-52. http://pmid.us/19454881. Taylor FR. Nutraceuticals and headache: the biological basis. Headache. 2011 Mar;51(3):484-501. http://pmid.us/21352223. Panetta J et al. Effect of high-dose vitamins, coenzyme Q and high-fat diet in paediatric patients with mitochondrial diseases. J Inherit Metab Dis. 2004;27(4):487-98. http://pmid.us/15303006. We’re in the midst of a series exploring therapeutic ketogenic diets. Our immediate goal is to help the NBIA kids, Zach and Matthias, but most of the ideas will be transferable to other conditions – and even to healthy people who engage in occasional or intermittent ketogenic dieting for disease prevention. Clinical ketogenic diets often produce stunted growth and bone and muscle loss. Today I want to look at this phenomenon and what we can do to avoid it. Other negative effects highlighted in the review include kidney stones (7 children developed stones) and dyslipidemia (total cholesterol as high as 383 mg/dl). As we’ve discussed in previous posts, these are probably caused by malnutrition. Kidney stones are usually due to deficiency of antioxidants; dyslipidemia due to deficiency of minerals, vitamins, or choline. It’s a little hard to nail down the exact cause of the bone fractures and stunted growth because the diets were so atrocious. For those keeping score, Ross Carbohydrate Free consists of soy protein isolate, high oleic safflower oil, soy oil, and coconut oil, plus vitamins and minerals. Microlipid is a safflower oil emulsion. Ross Polycose is hydrolyzed cornstarch. Purified diets without added ultratrace elements support growth and reproduction, but investigators have noted that animals exposed to stress, toxins, carcinogens or diet imbalances display more negative effects when fed purified diets than when fed cereal-based diets. The second problem, from my point of view, is that they made little use of short-chain fats and ketogenic amino acids to make the diet ketogenic. Instead, they relied on protein and carb restriction and overall calorie restriction to force ketone production. In short, they intentionally starved the kids. Obviously, starvation tends to produce stunted growth; this is why North Koreans are shorter than South Koreans. I believe such starvation is totally unnecessary. Use of short-chain fats and ketogenic amino acids can trigger high ketone production even on a nourishing diet. Another, closely related, problem on ketogenic diets is loss of muscle. You don’t often see bodybuilders or Olympic weight lifters who eat a continuously ketogenic diet. It can be hard to add muscle, especially on protein and carb restricted diets. This is true even if the diet is not calorically restricted. Which brings us to a rat study  discussed by CarbSane in her post “Ketogenic Diet increases Fat Mass and Fat:Total Body Mass Ratio”. The ketogenic diet also had lower micronutrient levels (“Ash” and “Vitamin”) than the control diet, and much higher omega-6 levels. Rats were fed ad libitum, meaning they could eat as much as they liked; they chose to eat twice as many calories on the ketogenic diet. This suggests that the diet was protein+carbohydrate deficient. When protein+carbohydrate intake is deficient, muscle will tend to be catabolized for protein. This causes muscle loss. Meanwhile, the starvation response – especially when more calories are eaten – tends to lead to fat mass gain. 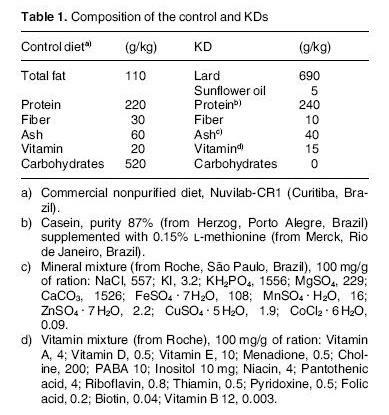 You can see in panel A that rats on the control diet weighed more than rats on the ketogenic diet. 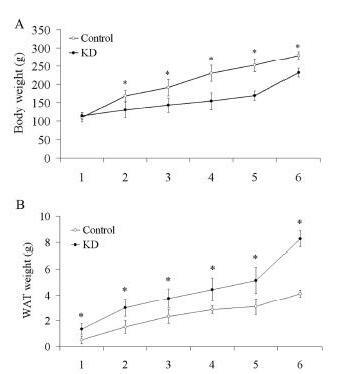 But panel B shows that rats on the ketogenic diet had more white adipose tissue (WAT). The ketogenic diet rats had more fat mass but less body mass; they had obviously lost muscle and bone mass. I believe this is due to eating too little protein and carbohydrate. Protein+carbs were 13% on the ketogenic diet, 75% on the control diet. 13% is just too little. For humans, we recommend a minimum protein+carb intake of 600 calories per day, which is about 30% of calories for a sedentary adult. Rats kept in shoebox cages are, of course, sedentary whether they would like to be or not. 2. Losing muscle may invoke the starvation response, causing you to gain fat. The paper did not measure length of the rats, but I would bet that the ketogenic diet rats were not only lighter, but shorter as well. Like the children on Johns Hopkins Hospital’s diet for epilepsy, these malnourished rats experienced stunted growth. As we discussed in the first post in this series, Ketogenic Diets, I: Ways to Make a Diet Ketogenic, there are 3 ways to make a diet ketogenic. One of them is severe protein+carb restriction, but the other two – short-chain fat consumption and supplementation of the ketogenic amino acids lysine and leucine – can generate ketosis even if substantial carbs and protein are eaten. So it’s worth exploring: with consumption of these ketogenic nutrients, plus substantial carbs and protein, can the health impairments of clinical ketogenic diets be avoided? Via Nigel Kinbrum comes an interesting paper  exploring the use of branched-chain amino acids as an adjunct to ketogenic diets for epileptic children. Most branched-chain amino acids are ketogenic, so this is a good test of my hypothesis. None of our patients had a remarkable reduction in the level of urine ketosis after the supplementation of branched chain amino acids. Moreover, no exacerbation of seizures in terms of frequency or intensity was noted in any of the 17 patients of the study. Regarding the improvement of seizures, we found 3 patients who had already achieved a reduction of seizures on the ketogenic diet to experience a complete cessation of seizures, while 2 other patients had a further reduction of seizures from 70% on ketogenic diet to 90%. In 2 other patients, the percentage of improvement with the branched chain amino acids supplementation was even greater, achieving 50% and 60% before branched chain amino acids supplementation to 80% and 90% afterward. One patient had 50% improvement (Table 1)…. There were no significant side effects; only a transient elevation of heart rate at the start of supplementation. For the NBIA kids, Zach and Matthias, we want the diet to be as ketogenic as possible. This is important because glucose is unable to feed neurons due to the inability to make CoA in mitochondria and bring pyruvate into the citric acid cycle. If only ketones can feed the brain, it’s important to make as many of them as possible. So we would like to give a lot of lysine and leucine. If we have to add other branched-chain amino acids to avoid leucine toxicity, it would be better to add isoleucine, which can be ketogenic, than valine which is only glucogenic. The BCAA-for-epileptic-children paper  can help us judge safe dosages. Supplemental leucine can be at least 45 g/day, since that was give successfully to the epileptic kids. Lysine can be at least as much, since it is non-toxic. Already we’re up to around 400 calories from supplemental lysine and leucine, which is a healthy amount. Is it necessary to give a lot of isoleucine and valine with leucine? That’s unclear. Leucine by itself may have special benefits for NBIA/PKAN kids. Paper  shows an interesting set of reactions in the brain: leucine plus pyruvate can be transformed into alpha-ketoisocaproate plus alanine in brain mitochondria. This is extremely important, perhaps, because removing pyruvate from brain mitochondria might prevent iron accumulation in the brain. Iron accumulation in PKAN is thought to result from pyruvate buildup in mitochondria. Pyruvate attracts cysteine, because pyruvate and cysteine are normally converted to downstream products with the aid of the PanK2 enzyme that is lost in PKAN. With the loss of PanK2, pyruvate and cysteine build up, and the cysteine chelates iron, trapping it in brain mitochondria. If leucine can remove pyruvate from brain mitochondria, it may also diminish cysteine levels and therefore reduce iron trapping in mitochondria. The iron buildup that is so debilitating might be prevented or mitigated. I believe the extreme limits on carb and protein intake in conventional clinical ketogenic diets are responsible for their growth stunting, muscle destroying, fattening effects. In order to supply sufficient protein and carbs while maintaining ketosis, it is necessary to provide ketogenic short-chain fats and amino acids. Clinical testing of such supplemented diets has so far produced encouraging results. Providing supplemental amino acids to epileptic children on ketogenic diets improved their health and allowed them to maintain ketosis with higher protein intake. Seizure frequency was reduced even as side effects diminished. Personally, I wouldn’t attempt a long-term ketogenic diet without the aid of coconut oil (or MCTs), lysine, and the branched chain amino acids. For the NBIA/PKAN kids, it seems that the amino acid supplements should be some mix of lysine, leucine, isoleucine, and valine, with the isoleucine and valine included solely to reduce leucine toxicity. The optimal amount of isoleucine and valine should be smaller than is found in branched-chain amino acid supplements, since leucine by itself may help prevent iron accumulation and increase ketosis. Also, one rat study  indicates that isoleucine alone, excluding valine, might be enough to relieve leucine toxicity. Excluding valine would increase the ketogenicity of the supplement mix. I think the NBIA/PKAN kids will need to experiment with primarily lysine and leucine, and secondarily isoleucine and BCAA supplements, to see what mix works best for them. Groesbeck DK et al. Long-term use of the ketogenic diet in the treatment of epilepsy. Dev Med Child Neurol. 2006 Dec;48(12):978-81. http://pmid.us/17109786. Hat tip CarbSane. Ribeiro LC et al. Ketogenic diet-fed rats have increased fat mass and phosphoenolpyruvate carboxykinase activity. Mol Nutr Food Res. 2008 Nov;52(11):1365-71. http://pmid.us/18655006. Hat tip CarbSane. Evangeliou A et al. Branched chain amino acids as adjunctive therapy to ketogenic diet in epilepsy: pilot study and hypothesis. J Child Neurol. 2009 Oct;24(10):1268-72. http://pmid.us/19687389. Hat tip Nigel Kinbrum. Tsubuku S et al. Thirteen-week oral toxicity study of branched-chain amino acids in rats. Int J Toxicol. 2004 Mar-Apr;23(2):119-26. http://pmid.us/15204732. Yudkoff M et al. Brain amino acid requirements and toxicity: the example of leucine. J Nutr. 2005 Jun;135(6 Suppl):1531S-8S. http://pmid.us/15930465. Mawatari K et al. Prolonged oral treatment with an essential amino acid L-leucine does not affect female reproductive function and embryo-fetal development in rats. Food Chem Toxicol. 2004 Sep;42(9):1505-11. http://pmid.us/15234081. Tsubuku S et al. Thirteen-week oral toxicity study of L-lysine hydrochloride in rats. Int J Toxicol. 2004 Mar-Apr;23(2):113-8. http://pmid.us/15204731. I was going to write a single post about how to implement a therapeutic ketogenic (ketone-generating) diet. 1) Safety. Does the diet generate side effects? 2) Therapy. Is the diet as curative as it can be? 3) Pleasurability and practicality. Is the diet unnecessarily expensive, unpalatable, or boring? 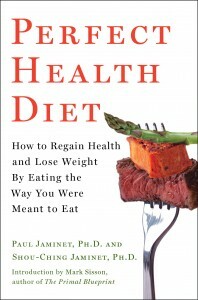 I soon realized that with so many factors affecting diet design, it would be hard to fit everything into a single post. So I’m going to split up the discussion into parts. Today I’ll look at the various ways to make a diet ketogenic. On Tuesday I’ll look at how to design a diet for Kindy’s NBIA kids. We’ll look at what they’re eating now, and consider ways they might be able to improve their diets further – and, hopefully, get further improvements in health, longevity, and function. Maybe we’ll look at some other diseases after that, or maybe I’ll just move on to the lemon juice series I’ve been planning. The lemon juice and acid-base balance issues will fit in nicely since kidney stones and acidosis are risks of ketogenic diets and lemon juice relieves those risks. So: how can we make a diet ketogenic? The liver is responsible for making sure that the body (but especially the brain and heart) have access to a sufficient supply of energy from the blood. To fulfill that responsibility, it manufactures two energy substrates – glucose and ketones – and exports them into the blood as needed. The most important ketones are acetoacetic acid and beta-hydroxybutyric acid. Ketones are water-soluble small molecules. They diffuse throughout the body into cells, and are taken up by mitochondria and oxidized for energy. While preparing this post, I was surprised at how long it took for doctors to appreciate that ketones are an acceptable alternative energy source for the brain. The realization that the brain doesn’t perpetually rely on glucose during starvation apparently didn’t sink in until 1967! The use of prolonged starvation for the treatment of obesity has posed a fascinating problem; namely, that man is capable of fasting for periods of time beyond which he would have utilized all of his carbohydrate resources and all of his proteins for gluconeogenesis in order to provide adequate calories as glucose for the central nervous system. This makes it a bit easier to understand why ketogenic diets have not yet become standard therapies for neurological diseases. Epileptics caught a lucky break – the ketogenic diet was already in use for epilepsy in the 1920s. The ketogenic diet’s therapeutic potential for other neurological disorders probably couldn’t have been appreciated until after 1967, and by then medicine had turned its back on dietary therapy. Glycogen – a storage form of glucose. However, glycogen supplies are minimal. “Complete” protein – a mix of amino acids similar to that found in animal meats. Long-chain fats – fatty acids 14-carbons or longer in length, attached to a glycerol backbone as either triglycerides or phospholipids. Glycogen can be used to make glucose but not ketones. So glycogen converts 100% to glucose. Triglycerides and phospholipids are broken up into their constituent parts. The fatty acids can make ketones but not glucose; the glycerol backbones can make glucose but not ketones. Typically, 10-12% of energy from a triglyceride is in the form of glycerol (which has the potential to become glucose) and 88-90% is in the form of fatty acids (which have the potential to become ketones). As we note in the book, during starvation the body is cannibalizing tissues that are roughly 74% fat, 26% protein by calories. Due to the preponderance of fat, starvation is highly “ketogenic” (ketone generating). The 26% of calories that are protein generate roughly equal amounts of ketones and glucose, but the 74% of calories that are fat generate only ketones. This doesn’t mean that during starvation ketones are 87% of energy and glucose 13% of energy. Most of the fats are burnt directly for energy without conversion to ketones. But a fair amount of fats are diverted into ketone production, and ketones are abundant during starvation. If your diet could include only compounds found in the body – glucose, complete protein, and long-chain fats stored as triglycerides or phospholipids – then we can use the above numbers to estimate the “ketogenic potential” of the diet. This formula basically treats all fats as triglycerides of long-chain fatty acids, and protein as “complete” protein with a typical mix of amino acids. It makes a ratio of the ketone precursors to the glucose precursors. Wilder’s “ketogenic ratio” was used by Dr. Richard Bernstein in his Diabetes Solution to help people appraise the ketogenicity of a diet. A ratio below 1.5 signifies a minimally ketogenic diet; the higher the ratio goes above 1.5, the more ketones will be generated. Short-chain fats such as are found in coconut oil. A mix of amino acids that is not “complete,” but is biased toward the ketogenic amino acids. If you do this then your diet will be more ketogenic than Wilder’s formula would suggest. Eating these foods may be advantageous. For instance, suppose you want to eat enough carbs to avoid “zero-carb dangers” such as mucus deficiency. At the same time, you want to generate abundant ketones to nourish the brain. You can achieve both by eating carbs for glucose, but also eating short-chain fats and ketogenic amino acids to make ketones. So let’s look at why these foods are so effective at producing ketones. The main metabolic process which converts one metabolic substrate into another is called the citric acid cycle, tricarboxylic acid (TCA) cycle, or Krebs cycle. By amino acids which can enter the TCA cycle at various points. The green boxes show glucogenic amino acids entering the cycle. The white boxes show ketogenic amino acids that are made into either acetyl CoA or acetoacetyl CoA and thence can either leave as ketones (via HMG-CoA) or enter the cycle by conversion of acetyl CoA to citrate. Leucine and lysine appear only in white boxes, not in green boxes. They are purely ketogenic. Isoleucine, tryptophan, phenylalanine, and tyrosine appear in both green and white boxes. They can be either ketogenic or glucogenic. The other amino acids appear only in green boxes and are purely glucogenic. So if the diet is rich in leucine and lysine, but poor in glucogenic amino acids, then it will be highly ketogenic. Fats are made into acetyl CoA. Acetyl CoA can either enter the TCA cycle or be converted to ketones. What decides which way it goes? One important factor is whether the cell has enough ATP. If the cell has plenty of ATP then it won’t allow the TCA cycle to make any more, and the TCA cycle gets stuffed with succinyl CoA and then with all the other intermediates in the pipeline behind it. Once the TCA cycle is full, acetyl CoA no longer enters the cycle and instead leaves as ketones. Long-chain fats can serve as structural molecules in cell membranes throughout the body. Long-chain fats can be stored in adipose cells. Long-chain fats can be burned by cells throughout the body, and transported to cells that need them. These factors mean that you have to eat a very large amount of long-chain fats before you produce substantial ketones. Short-chain fats (12 carbons or less in length; often called medium-chain) are different. Short-chain fats do not appear in cell membranes and are not stored in adipose tissue (except for a little 12-carbon fatty acids). Rather than being transported throughout the body, they are shunted to the liver for disposal. This means that if you eat a lot of coconut oil (which is 58% short-chain fats), you deliver a lot of fat to the liver for disposal. The disposal process for fat is conversion to acetyl CoA followed by either burning in the TCA cycle or conversion to ketones. After a big cup of coconut oil is delivered to the liver, the liver’s ATP levels are quickly saturated. The TCA cycle is stuffed and the liver will dispose of the coconut oil by making ketones. It will do this whether the rest of the body needs the ketones or not. The liver wants to get rid of the coconut oil, and it does it by making ketones whether the rest of the body wants them or not. 1) Make Wilder’s “ketogenic ratio” high by eating a lot of fat, very few carbs, and not too much protein. 2) Supplement with the ketogenic amino acids lysine and leucine. 3) Supplement with coconut oil or another source of short-chain fats. If we do (2) or (3), then the diet can be ketogenic even if it has a fair number of carbs. So now we have an arsenal of ways to generate ketones. We have to look at diseases and diet risks to figure out which way of making the diet ketogenic is optimal. I’ll look at that next week. Owen OE et al. Brain metabolism during fasting. J Clin Invest. 1967 Oct;46(10):1589-95. http://pmid.us/6061736.